From the UK's no 1 Vitabiotics supplement range. The Queen's Awards for Enterprise Innovation 2018. Gluten free. No lactose or yeast. No preservatives. No artificial colours. Jointace is not tested on animals. Micronutrient supplement with glucosamine collagen ^hydrolysed type II collagen] chondroitin, vit. D, Vits C, E, B12, Minerals & Ginger Ext. Expert support from Jointace® Jointace® contains a unique combination, ideal for those with an active life, in sport, or in later life. Collagen formation: Vitamin C contributes to normal collagen formation for the normal function of bones and cartilage. Connective tissues: Copper contributes to the maintenance of normal connective tissues. Bone health: Vitamin D, zinc and manganese contribute to the maintenance of normal bones. USP Purity Standard The Glucosamine Sulphate and Chondroitin Sulphate used in Jointace® conform to United States Pharmacopeia (USP) purity standards. Directions Two tablets per day with your main meal. Swallow with water or a cold drink. Not to be chewed. Do not exceed the recommended intake. 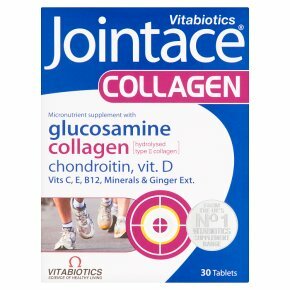 Jointace® Collagen contains glucosamine sourced from natural chitin. Diabetics and those using blood thinning medication (e.g. warfarin), should consult their doctor before using this product. This formula replaces other Jointace® supplements. A regular intake is recommended. Jointace® Collagen is recommended with a balanced diet, rich in fish oil. The recommended intake of 2 tablets provides: Glucosamine 592mg, provided by Glucosamine Sulphate 2KCI 1000mg. FOOD SUPPLEMENT<br>Food supplements must not replace a varied and balanced diet and a healthy lifestyle.<br>As with other food supplements, consult your doctor or pharmacist before using if you are under medical supervision, pregnant, breast-feeding, have epilepsy, suffer from food allergies, or are allergic to any of the ingredients. Not suitable for children.